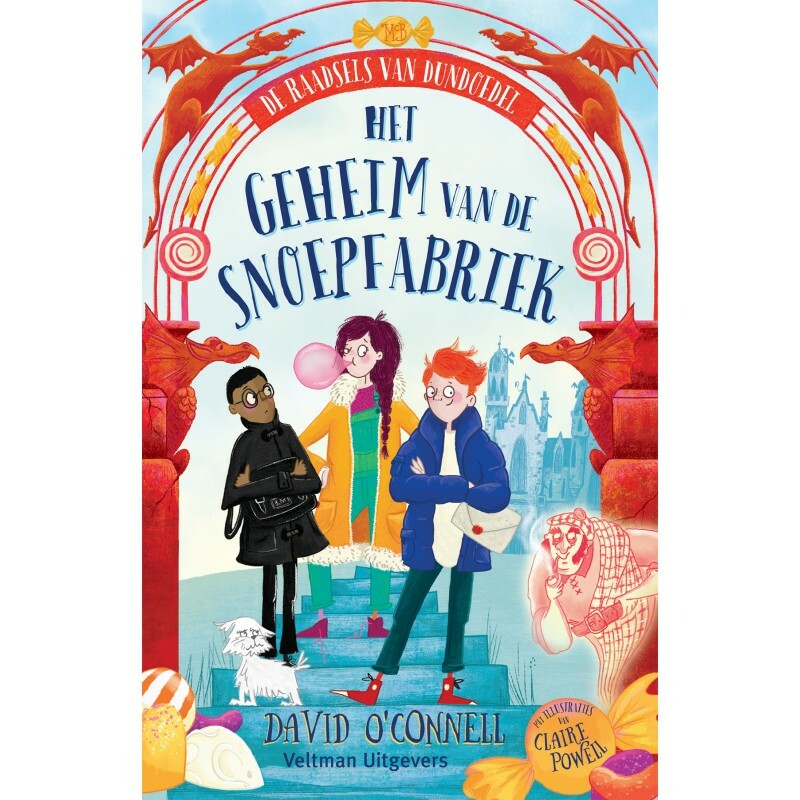 The second book of The Dundoodle Mysteries finally came out in Thursday – World Book Day in the UK! Once again, it feels like I’ve been talking about a book for ages and then, suddenly, it’s actually in shops and in people’s hands. It’s always exciting when a new book comes out, and this was no exception. 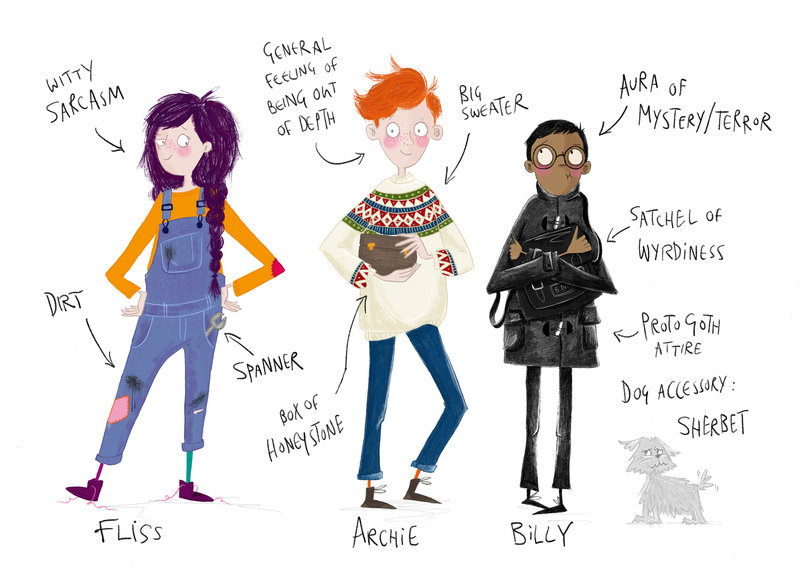 Here’s the fabulous animated trailer – made by illustrator Claire Powell. The trouble with talking about the same book over and over again is that it’s difficult to find something new to say each time. 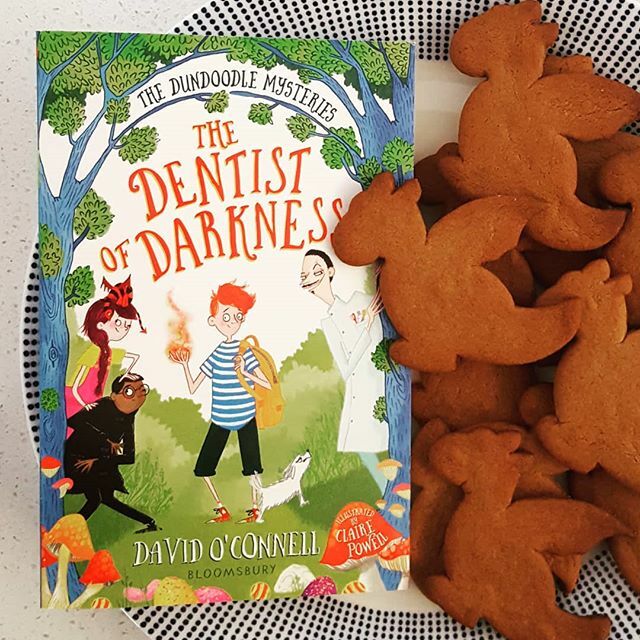 But I don’t think I’ve written before that I think The Dentist of Darkness is my favourite of the the Dundoodle books. It has the fun and sweets and the mystery of The Chocolate Factory Ghost, but it also has a atmosphere of magic and darkness all of its own. It goes deeper into the mythology of the town and Archie’s own family history. Archie frowned. ‘That sounds like Halloween to me,’ he said. 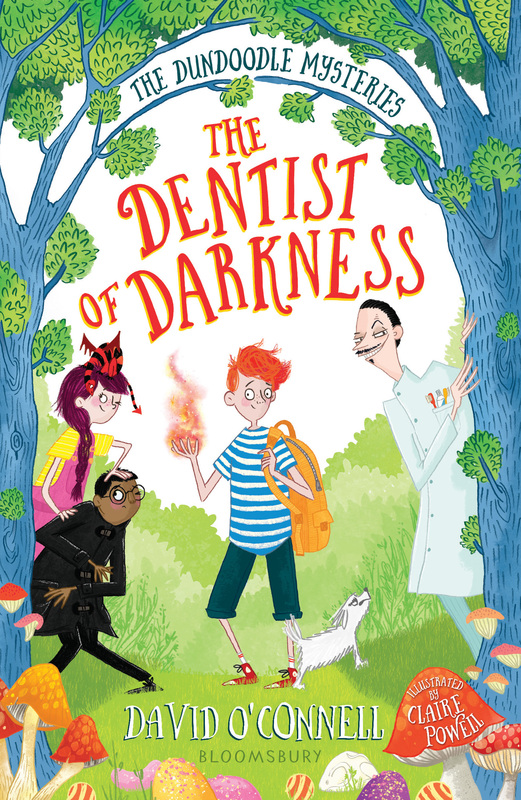 All the info for The Dentist of Darkness can be found here. I’m really looking forward to hearing what everyone thinks about it. I’ve been doing some events as part of the launch for the book, and will post some photos once I get hold of them. But I was particularly pleased to see a Joe Shoe from Monster & Chips! 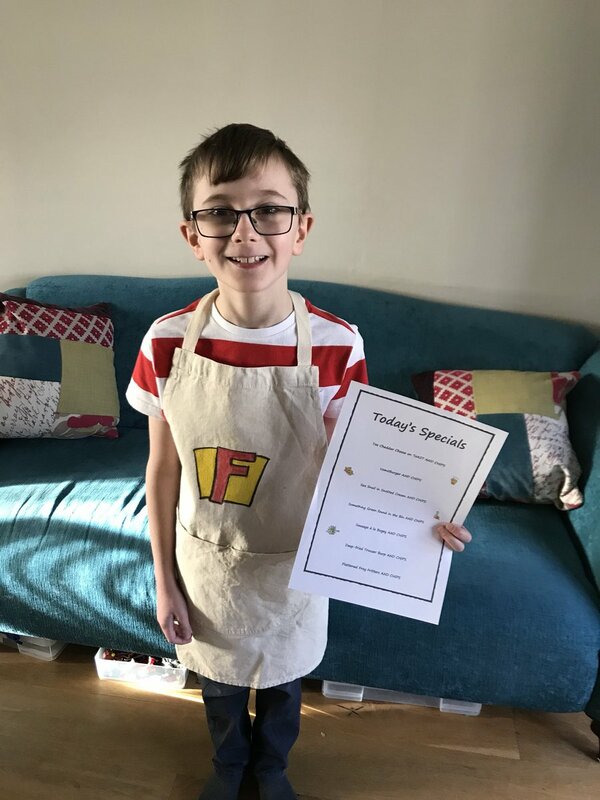 I love the apron – just right for serving some monstrous food. 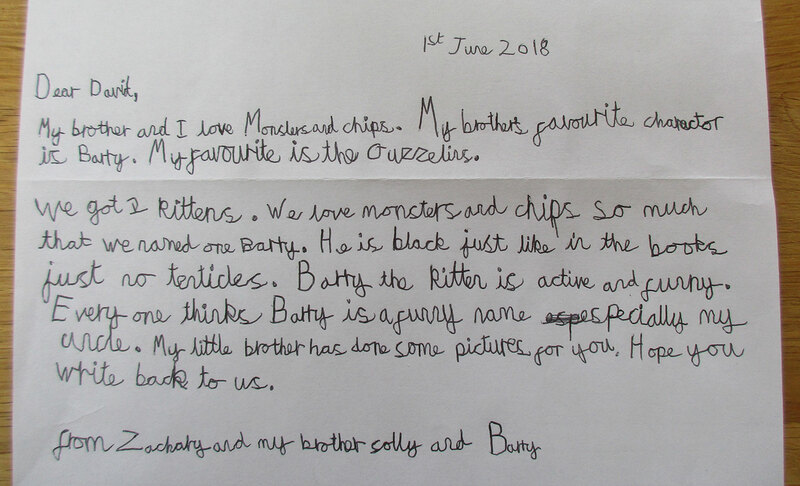 Monster & Chips came out almost exactly six years ago, so it’s great to see it’s still got readers after all this time. Thank you so much for choosing to dress as Joe, Xavier! It’s made for a fantastic week all round. A busy afternoon for me yesterday, but away from the desk for a change. All previous episodes of DTRH are available on Mixcloud or via iTunes. Thank you for having me, DTRH! 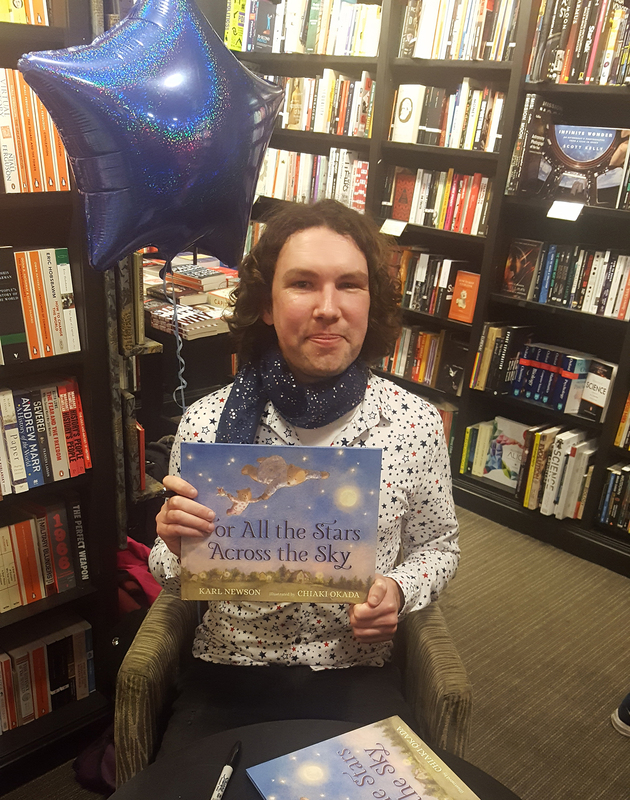 Then straight from the studio to Waterstones Covent Garden for the launch of my book buddy Karl Newson‘s new picture book, illustrated by Chiaki Okada. For All the Stars Across the Sky is a beautiful book, perfect for bedtimes. The artwork is stunning, and Karl knows just how to strike the right note with his text. 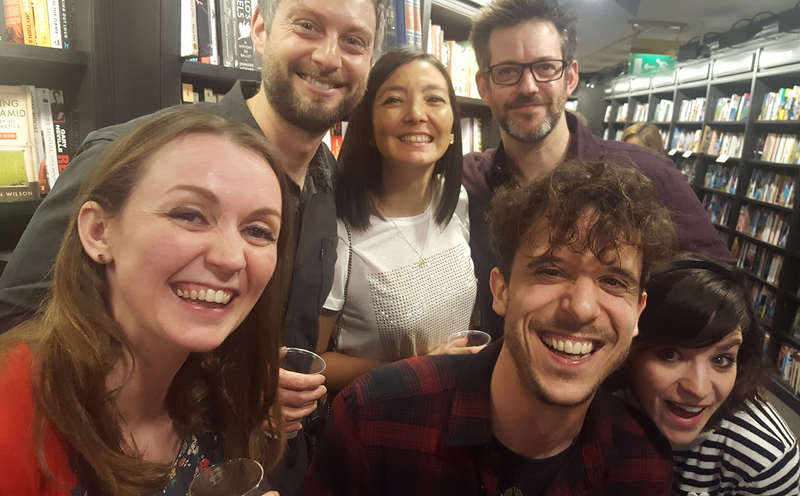 It was so nice to see a launch so well-attended, and it was great to catch up with various other book chums too. Chloe Douglass, Steven Wood, Samantha Meredith, Tim Budgen, Jamie Littler & Laura Ellen Anderson. A very belated happy New Year to you! I’m having a catch-up with myself after a busy December and January, and February has been much of the same. 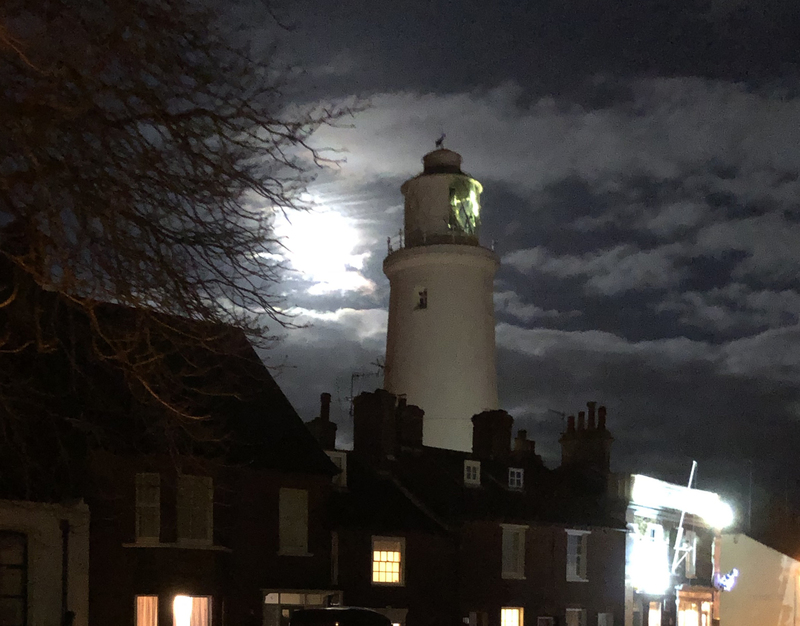 I spent Christmas in Southwold, Suffolk, in a little cottage sat beneath the lighthouse. Even then I was working. 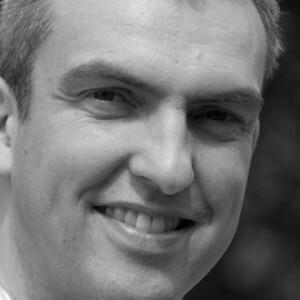 I was up at 6am every day – including Christmas Day – to do some writing. However, I stopped at 9am so I could have a proper holiday too. 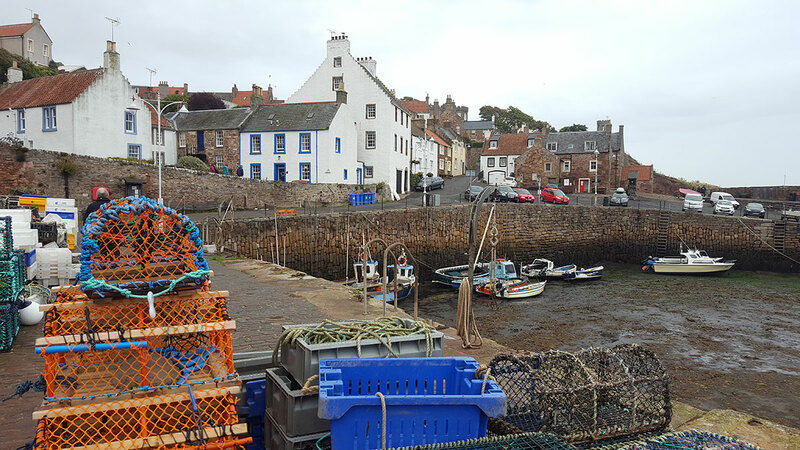 It made all the difference: I managed to get my first draft of the third Dundoodle mystery completed on time, and the location helped a lot. Southwold is a very atmospheric town with its quaint streets, crab shacks and smokehouses on the wharf, its rolling dunes and flat marshlands. As the book is a sea-themed mystery there was plenty of inspiration. Look out for mermaids, viking boats and underwater chases! First reactions from my editors have been good, so the edits aren’t too taxing, thankfully. But I’m getting ahead of myself – never mind about Book Three, Book Two is almost upon us! I’ve already been sent my advance copies, and I’m so pleased with it! 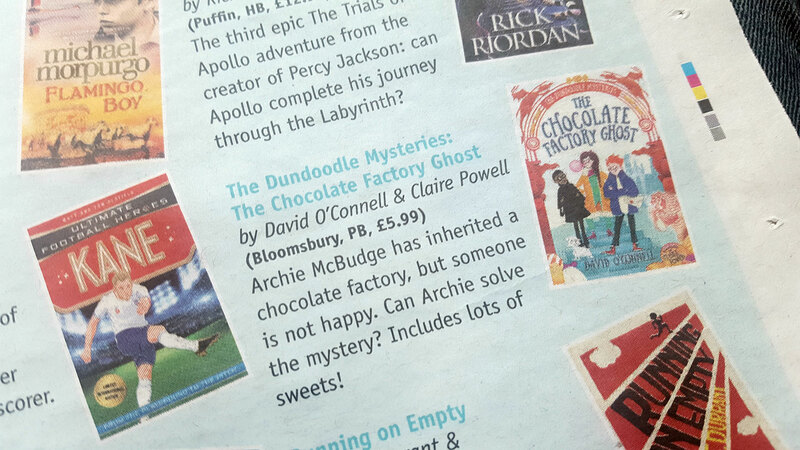 Side by side with The Chocolate Factory Ghost, it looks very handsome indeed, thanks to Claire Powell‘s cover. And her illustrations inside are phenomenal. There’s a darkness to this book that’s she’s captured perfectly. And you can see this for yourself: my publisher has just put the first four chapters online! I hope that’s given you a taste for more! 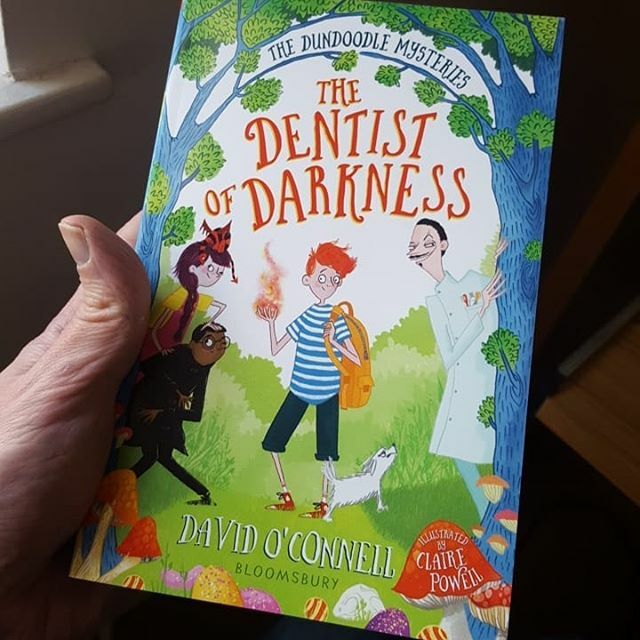 All the info for The Dentist of Darkness can be found here, and I’ve just had confirmed that the audio book is in the works too. 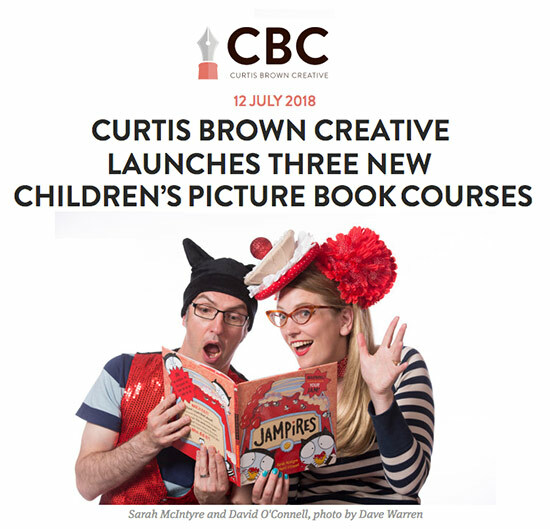 Meanwhile, I’ve been creating an activity pack to go with The DoD, containing puzzles and creative writing ideas – you can download the one I created for The CFG here. One of the activities for the new pack is a recipe for Gingerbread Dragons – they play a important part in the story, but then biscuits are always important. I’d thought I’d better test out the recipe, naturally! They turned out ok, but decorative icing was beyond my abilities – let me know if you do a better job! I can say they’re nice and crisp and great for dunking in tea – the perfect accompaniment for a good book. 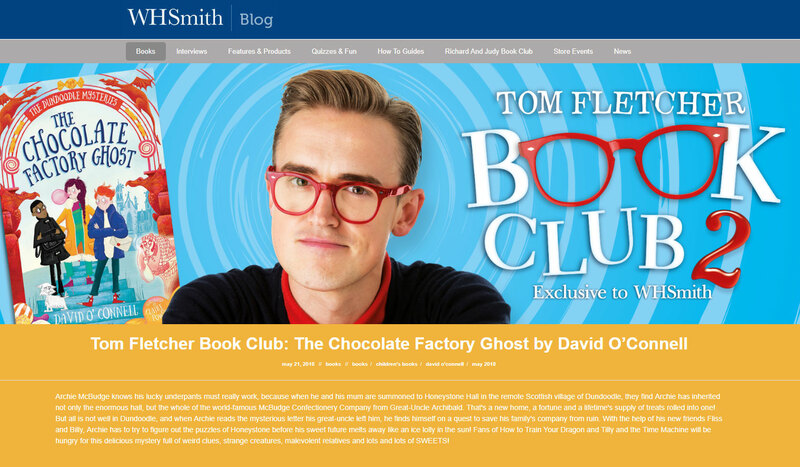 Claire Powell and I have popped up on Tom Fletcher’s Youtube Channel as part of Tom’s Book Club. My TV career starts and ends here. 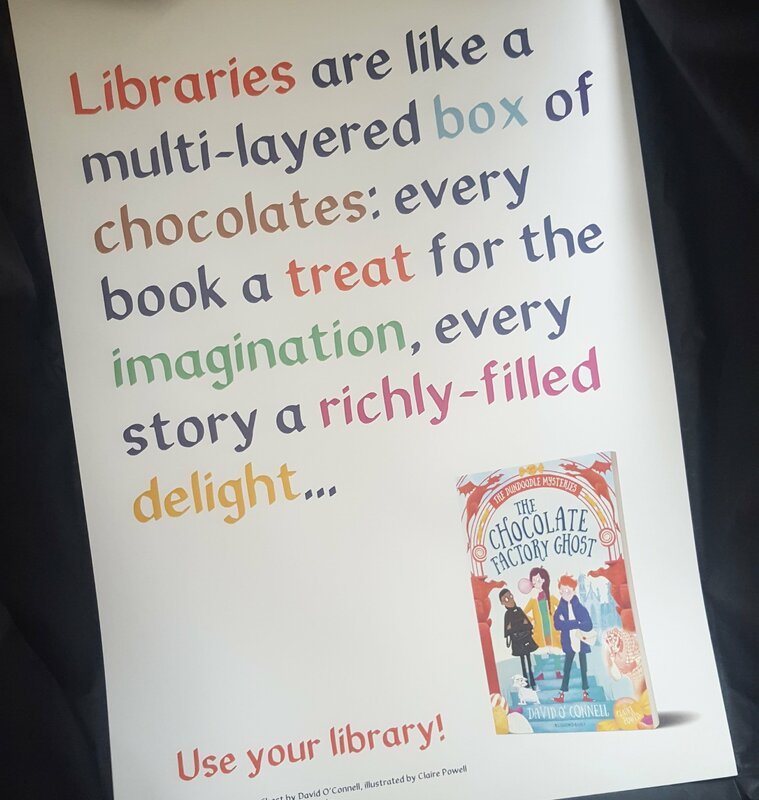 On the way back home from Bournville, I picked up a copy of The Guardian and was very pleased to see a plug for The CFG in its Best New Children’s Books supplement that launched Independent Bookshop Week, celebrating independent bookshops in the UK and Ireland. Do make use of your local independent bookshop if you’re lucky enough to have one. 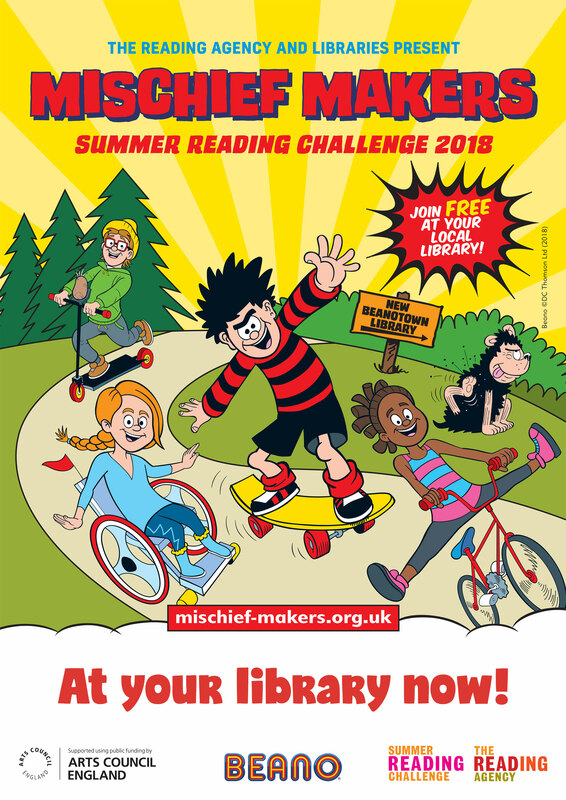 Other bookshops are great too, but they’re all facing tough times competing with online retailers and won’t last on our high streets if we choose price over good service: many bookshops run homework clubs or book groups as well, and offer their premises for launches and other community events. 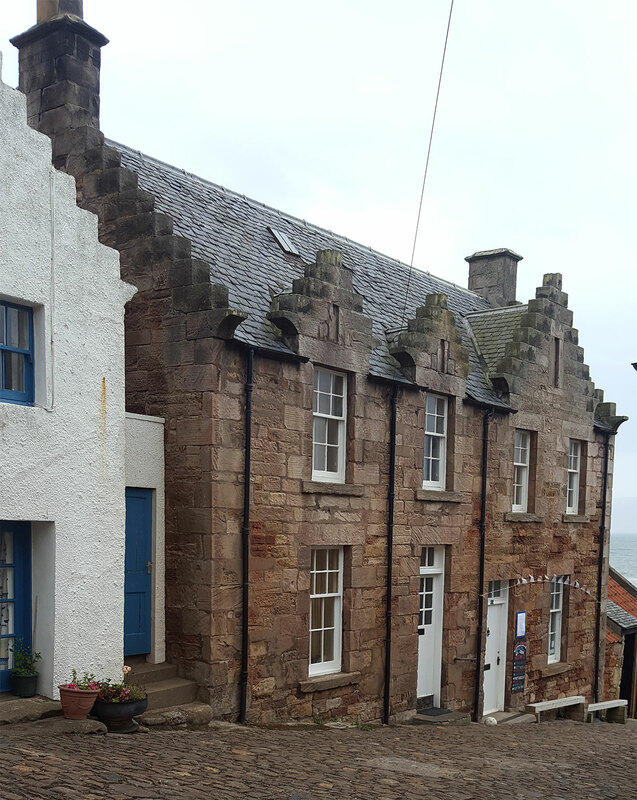 It always warms my heart to see a town with its own bookshop – you can find your nearest one here. 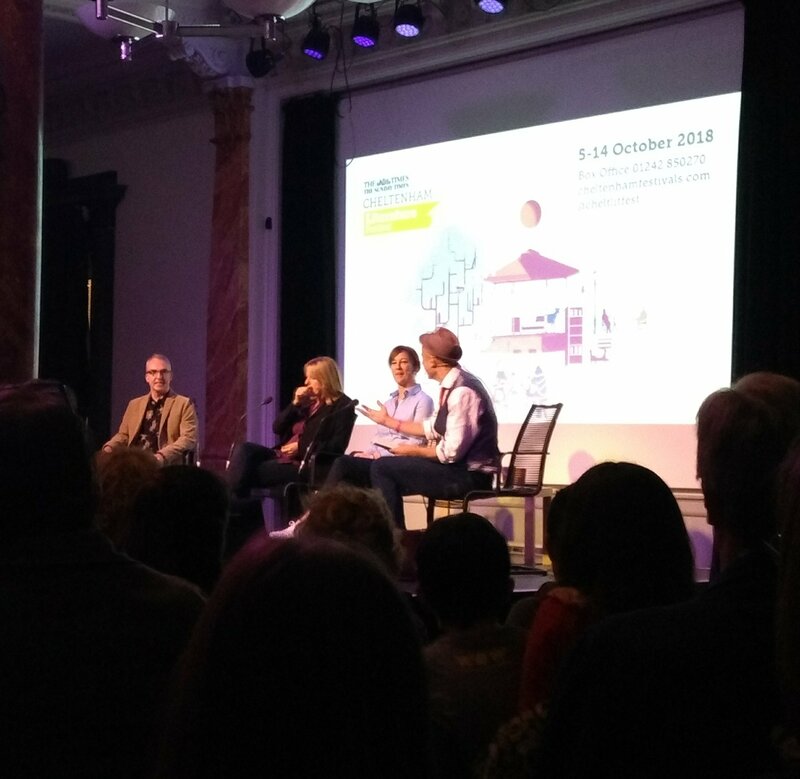 Last Saturday, Claire Powell and I went to Bournville, home of Cadbury’s chocolate factory, for a rather fabulous event held at Selly Manor. This Tudor manor house (it actually dates back to at least 1327, but has had alterations since) was transported in the early 20th Century to Bournville from nearby Bournbrook. George Cadbury wanted it to be one of the centrepieces of Bournville village, and in doing so saved it from destruction. Bournville is an amazing place, a model village built by Cadburys for their workers. It’s very picturesque, with plenty of the Cadbury trademark purple in evidence, and well worth a visit if you’re visiting Cadbury World nearby. 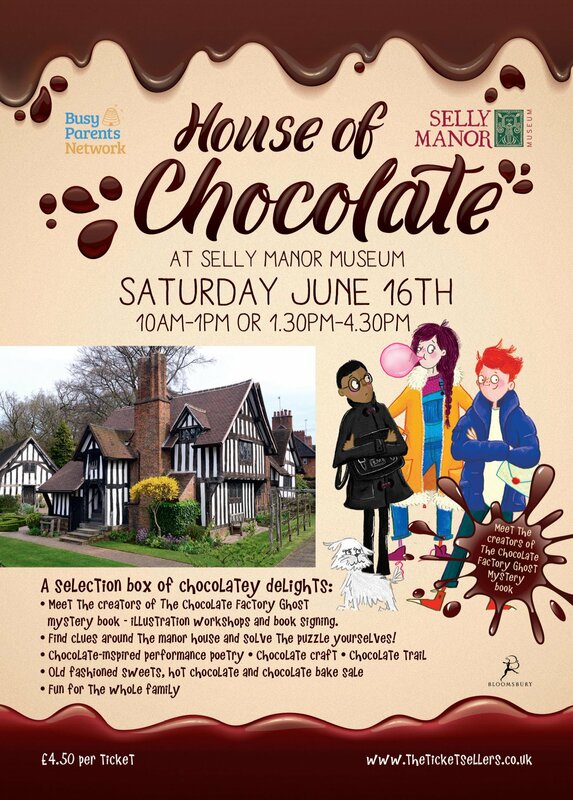 For our event, organised by Sarah Mullen of the Busy Parents Network (who also organise the Bournville BookFest), Selly Manor had been transformed into Honeystone Hall! (You can see the sign over the door way below.) 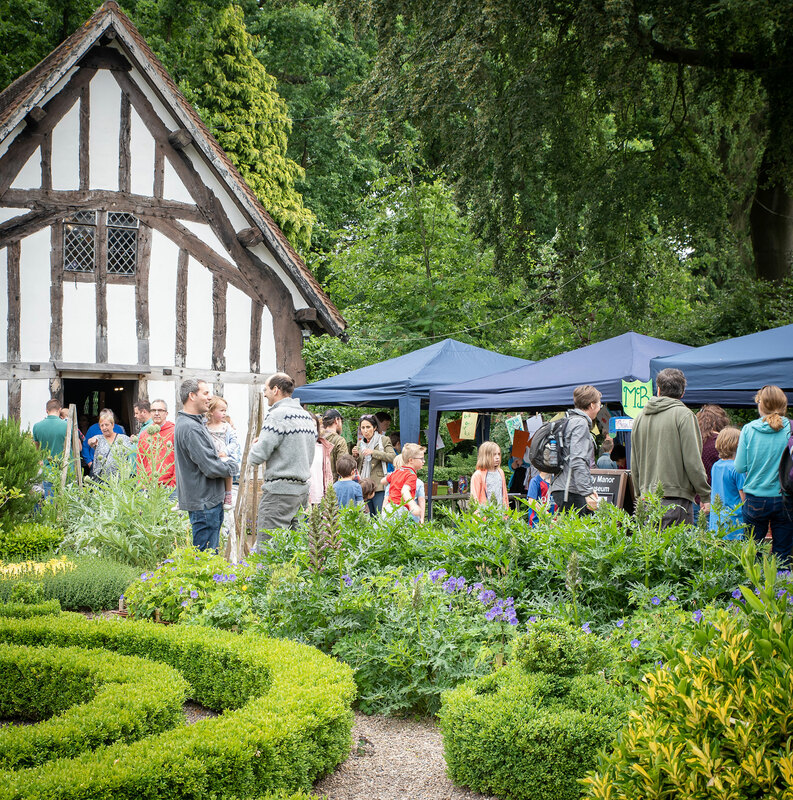 It was just part of a day of chocolate-themed events taking place in the Hall and its gardens. Back in 2014, I worked on a picture book with the brilliant Sarah McIntyre, called JAMPIRES, published by David Fickling Books. 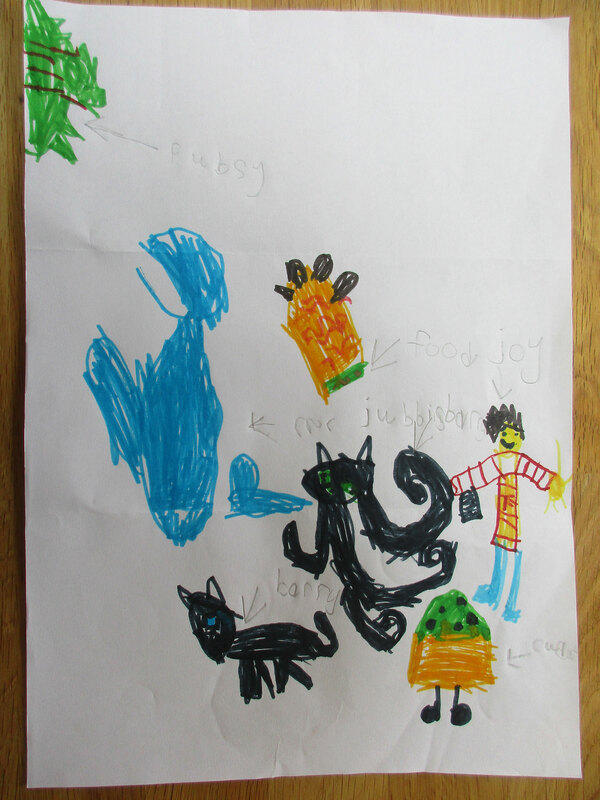 Sarah had an idea for these cute, little characters that were like vampires. But instead of blood, they loved to eat jam and other sweet things! 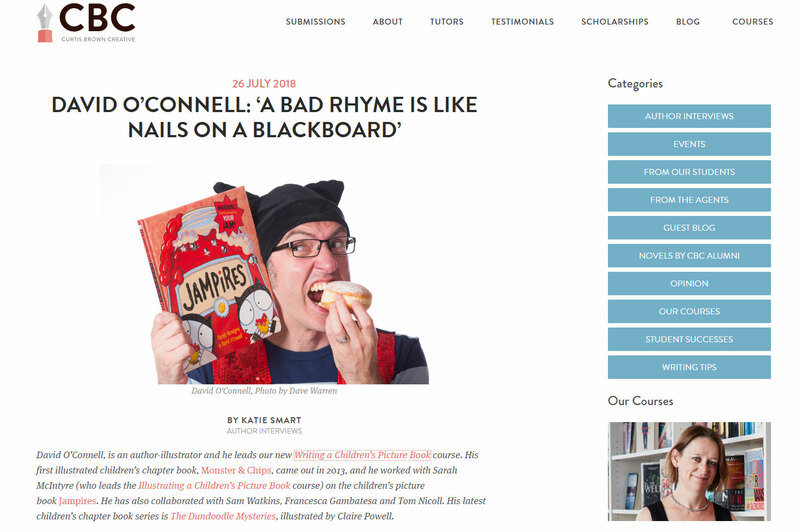 It took us ages to come up with a story that worked for them, and the book went through many, many revisions before we found a story everyone liked (Psst! Available to purchase here!). 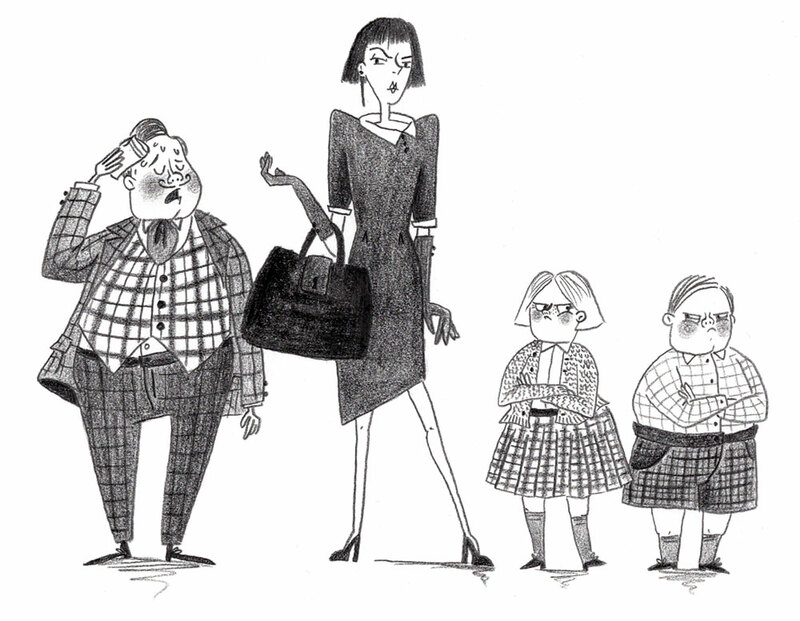 In one early version, I came up with a character called Mrs Puddingham-Pye – I can’t remember if she was meant to be a goodie or a baddie (she was probably both at one point or another). Georgie and Portia were a pair of nasty pets cats originally, rather than nasty twins. 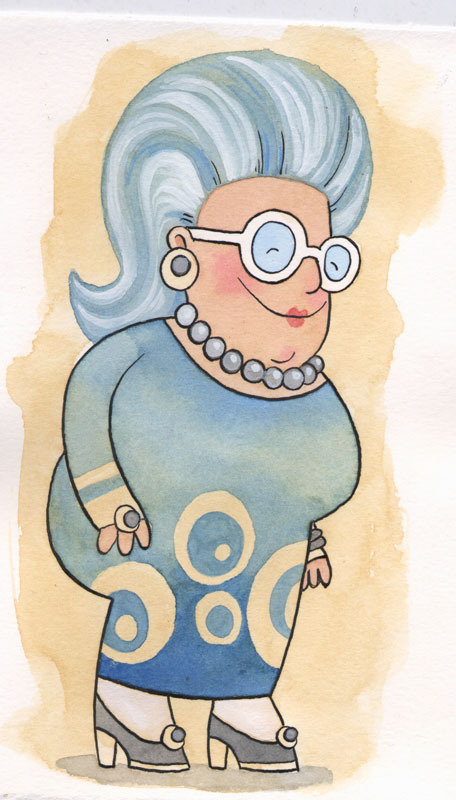 I imagined Mrs P-P to look like a deranged Jackie Onassis. Sarah even created this lovely painted study of her, based on one of my sketches. Mrs P-P didn’t last very long in Jampires, but I liked the character and the pun of her name, so stored her away for future use. There were a number of occasions when I thought I might use her, but the projects I was working on didn’t feel right. Eventually, as I wrote the first draft of The CFG, and needed an antagonist, I knew this was her chance! Several characters in The CFG have food-related names, so it was the perfect fit. 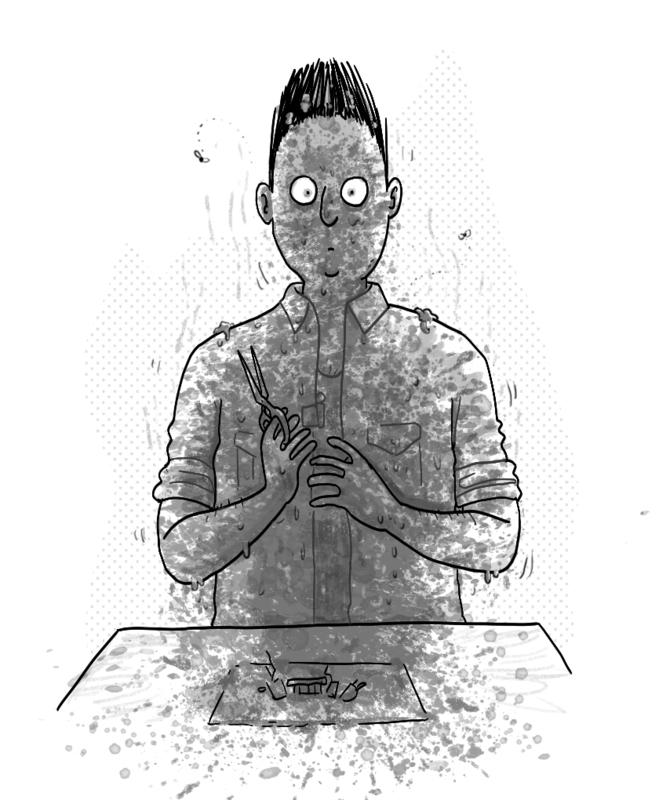 When I’m creating characters, I often draw them to get a feel for their personality. Here’s my design, complete with malevolent handbag, which I recycled as a character for the Inktober daily drawing challenge (a whodunnit) in 2016. It just shows it’s always worth hanging on to ideas you like – you can find a use for them somewhere eventually! 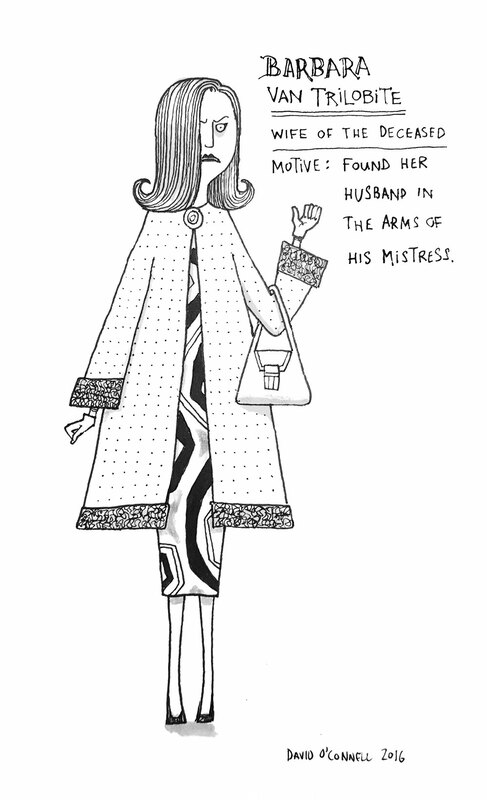 Of course, Claire Powell has created her own fabulous version of Mrs P-P for The CFG, and I was really pleased that she picked up on the deranged Jackie O vibe, without any interference from me! 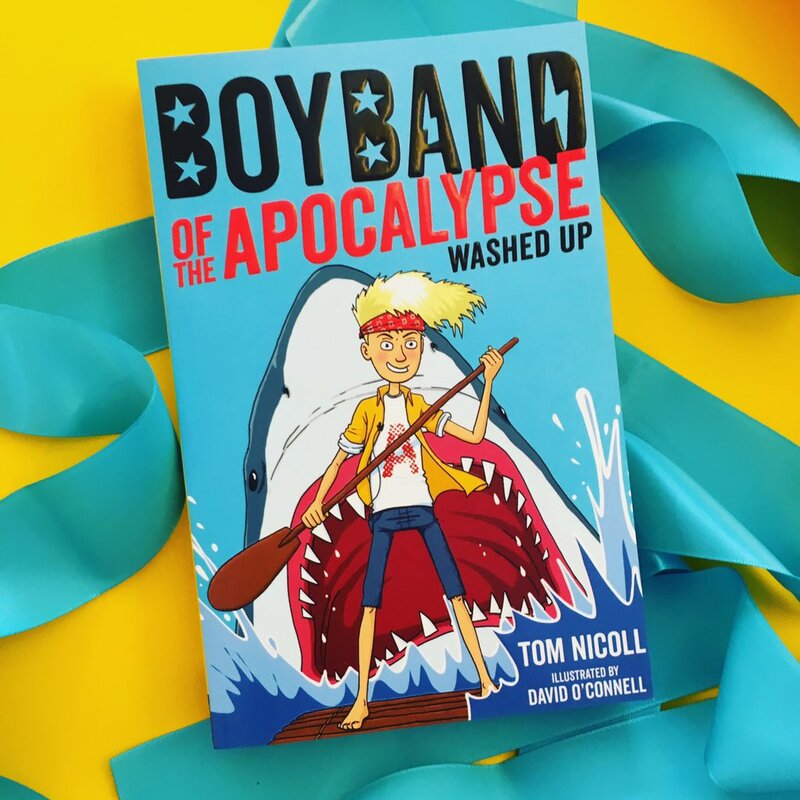 Happy publication day to Tom Nicoll‘s brilliantly funny and action-packed Boyband of the Apocalypse sequel, Washed Up! It was my pleasure to illustrate this book, which continues the story of Sam’s supernatural misadventures in the world of reality TV – this time on a twisted version of I’m A Celebrity Get Me Out of Here! Tom’s a very witty writer with a great sense of the absurd, and I really hope the book is a big success for him.